Back at the end of the last Ice Age, when I was in 10th grade, I made a 30 minute 8 mm version of "The Most Dangerous Game" with some buddies from high school. I've since lost the cassette tape with music from The Who, Henry Mancini and Eric Clapton that I put together to accompany my silent action flick, but the film itself is stored away in a closet. I've always liked Richard Connell's short story. Last night I finally got to see the original version of this classic short story. Made by many of the same folks who brought you "King Kong," "The Most Dangerous Game" is an action packed battle of ideologies which pits man against man as hunter and prey. Set in the South Pacific, the film opens aboard a pleasure yacht returning from a big game safari in Africa. The yacht's owner has ordered a change of course to save time. As the boat nears an island, the captain of the ship notices that the channel lights aren't where they should be according the chart. The owner orders him to proceed. The ship runs upon a coral reef and sinks. 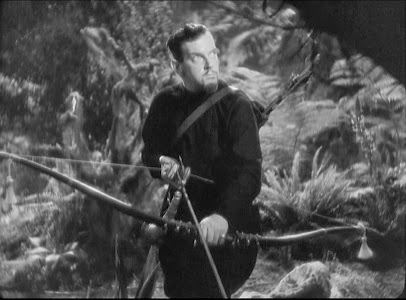 Robert Rainsford (Joel McCrea) is the lone survivor. He makes it ashore and finds a large restored castle. Rainsford knocks and enters. He is greeted by a large mute Cossack named Ivan (King Kong alum, Noble Johnson). The menacing Ivan says nothing as Rainsford tries to explain what has happened. Rainsford's discomfort at Ivan's menacing appearance is relieved as his host enters the room. Count Zaroff (Leslie Banks), dressed to the nines enters from above and bids Rainsford welcome ala Count Dracula. The Count escorts Rainsford into his large dining hall where he introduces Rainsford to Martin and Eve Towbridge (Fay Wray and Robert Armstrong), wealthy brother and sister who also were shipwrecked on the Count's island. The drunken Martin sings the Count's praises as he tries to ingratiate himself with his host. Eve looks a Robert as if to tell him that there is danger afoot. Martin asks Rainsford what he does for a living. The Count interrupts and informs Martin and Eve that they are in the presence of a celebrity. Rainsford was a noted hunter and adventurer who had written many books on hunting. It turns out that the good Count is also an avid hunter. As the evening wears on, the two hunter's verbal sparring. The cryptic Count informs his guests that his one passion in life is hunting. He hunted all over the world, and had begun to grow bored. He discovered a new game, the most dangerous game. His island compound is devoted to hunting that game. You know what comes next. 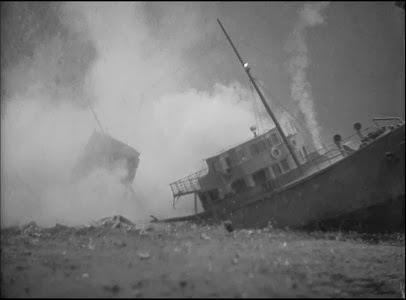 The Count causes the shipwrecks and hunts the survivors. He gives them a knife and several hours headstart. He begins to hunt at midnight. If the prey survives until sunrise they will be set free. The Count is excited to have Rainsford on his island. He tries to enlist him as a fellow sportsman. Rainsford refuses. The Count sees Rainsford as a kindred spirit as Rainsford has written in his books that the hunter has nothing to be ashamed of. He doesn't hate the tiger which stalks him anymore than the tiger hates the hunter for stalking it. The hunt is a game of wits. The animal hunts for food and is called savage while the man hunts for sport and is called civilized. Rainsford feels no shame with his chosen way of life. The Count believes he can turn him to the dark side. When this does not happen, the Count finds that he really has found the most dangerous game: a man of equal skill to hunt. 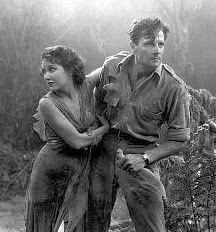 Filmed at the same time as "King Kong," "The Most Dangerous Game" was produced by Merian C. Cooper and David O. Selznick. 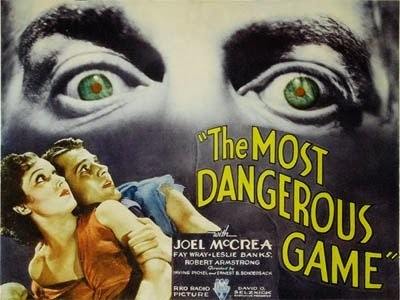 Directed by Irving Pichel and Ernest B. Schoedsack, "The Most Dangerous Game" has the same look as the island scenes from "Kong." Dark and moody with an underlying eroticism due to the presence of Ms. Wray. The Count hints at the revels that will take place with Ms. Wray after the hunt. The film is short and sweet. At 62 minutes, the filmmakers accomplish what many have been unable to do at 3 times the running time. 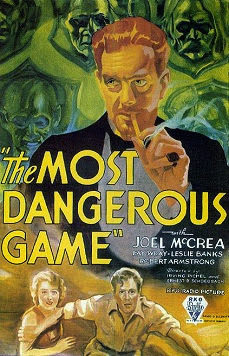 "The Most Dangerous Game" has may underlying themes and nuances which lift it above the multitude of action potboilers produced in the 1930s. The acting of the leads is quite good. Mr. McCrea brings a realistic style to the role of Rainsford. I would recommend watching this film back to back with Peckinpah's "Ride the High Country" which was McCrea's final film to see how much McCrea evolved as an actor. Leslie Banks is the personification of decadence and evil as the twisted Count Zaroff. Many of his lines are a hoot. What makes it great is that the humor is intentional. Fans of old movies often find the dialogue unintentionally funny. It's nice to see humor like this when it is intended. What can I say about Fay Wray. She sure was hot. Were that she and Maureen O'Sullivan were young actresses today. Her performance here is more subdued than in "King Kong." We only hear her famous scream twice. The only sore spot in this film is the performance by Robert Armstrong as the drunken Martin. Sometimes you run across a character in a movie like this where you know there will be a body count. I often wish the obnoxious character goes first. I sure wish Armstrong's character had died before the opening credits rolled. He seems out of place for the mood and pacing of the rest of the film. Buster Crabbe was McCrea's stunt double (just a tidbit for trivia fans).